Jamie's Nourishing Bites: GREENING IT UP WITH A NUTRITION PACKED GREEN SMOOTHIE!!! 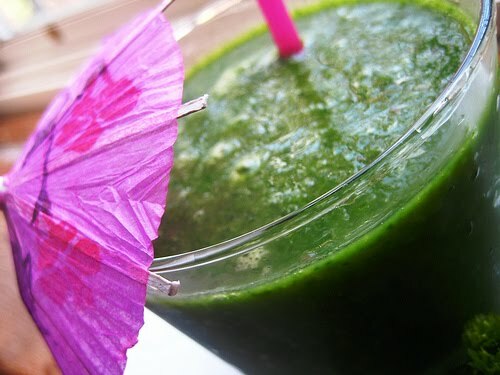 GREENING IT UP WITH A NUTRITION PACKED GREEN SMOOTHIE!!! Last night I got home from work around 7:30pm. I really didn't feel like a big meal so I decided to blend up a nourishing Green Smoothie. What...Smoothie for dinner, you ask?? I say....why not?? Smoothies are a great way to pack in a ton of nutrition all in one tasty drink. My smoothie last night packed in more nutrition than most people get in a day or for some a week. And yes...I did say tasty. You can make them delicious. All you have to do is add some great fruit and if your taste buds are anything like mine....some raw cacao powder!!! Last nights smoothie was creamy, tasty, health supportive and easy!!! Quick clean up too; one knife, one blender and one glass!! NOTE - If you don't have frozen fruit on hand, add some ice to the mix. Green smoothies seem to taste better when they are cold. If you are looking for more Green Smoothie recipes or wanting to do a green smoothie cleanse, check out the online tutorial by fellow nutritionist Meghan Telpner. It is jam packed with information!!! PLEASE NOTE - Consult your health care practitioner before beginning any cleansing routine!! PLEASE SHARE!!! I LOVE READING YOUR QUESTIONS AND COMMENTS!!! WHAT IS YOUR FAVORITE SMOOTHIE RECIPE??? Thanks for sharing Jane. Those are some great ideas!!! Checked out your blog. It is great!! !